Home > Healthy Hair > Can Poor Hair Care Cause Hair Loss? Hair loss is a perfectly normal part of your hair's growth cycle. It is common to lose anywhere from 50 to 150 hairs per day from hair shedding but poor hair care can lead to additional hair losses! Hair care refers to the hygienic and cosmetic aspects of maintaining your hair. Your hair in essence is 'dead', but much can be carried out to maintain and protect it. It is vitally important to know your hair type because its proper care and treatment will depend upon it. As it is not dry, greasy, or chemically treated, it generally holds its style and looks good. If your hair is like this, then a shampoo and conditioner designed for normal hair is fine. Often lifeless, with a flat appearance, lacks volume, is unmanageable and gets oily quickly. This hair should be washed with shampoo and conditioner specifically designed for Oily Hair, which will improve its feel and protect it against further damage. Often appears dull, feels dry, easily tangles, combs or brushes with difficulty, has been subject to perming, bleaching or colouring. For this hair type, shampoo and conditioner designed for dry hair should be used. Poor Care = Hair Loss? Hair loss can happen when using styling accessories, such as braids, pigtails or rollers, which pull on the hair and cause traction Alopecia. Such hair can grow back if pulling is stopped early on. Hair treatments using hot oils or chemicals can lead to damaged follicles and sometimes even hair loss. Illness, fever, pregnancy, changes in weight or drug use can lead to significant hair loss, but since these are often only short term there is only a limited interruption to the hair's growth cycle, where more hairs are in the resting phase than in the growing phase. Good care of your hair revolves around washing it on a regular basis to keep it healthy. Don't overdo it by excessive washing, as this can easily damage your scalp and a build up bacteria and other disorders such as dandruff. Allow your hair to 'lie' normally during washing and rinsing with warm water. Pour a small amount of shampoo onto your hand and work up into a lather before applying, and massage into your hair gently. Finally, rinse and let the water pass through your hair until it is very clean, being carefully not to rub it excessively since this can damage it. Ensure that all the shampoo has been rinsed out, and then pour a small amount of conditioner onto your hand and gently work into your hair and leave for a few minutes to activate. Rinse out the conditioner, using the shampooing procedure above. 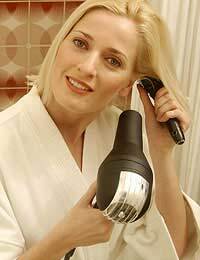 Dry your hair by patting it with a clean and dry towel. Tangles, splits and breaks can be removed by brushing or combing in a careful downward direction. Afterwards, small amounts of gel or mousse can be used. It is preferable to let your hair dry naturally, but at times this may be impractical, so you can take a quick fix by using a hair dryer or blow dryer. Take this route only when your hair has been dried using a towel and is damp, but not sopping wet! The dryer itself should be used carefully by constantly hovering it over your head, without focusing it on any areas to circumvent dryness. Always keep the dryer on its lowest speed and heat settings, and don't forget to turn it off prior to your hair becoming absolutely dry. To encourage good hair care, visit your expert hairdresser at regular intervals. Hi, I agree that it is normal to lose about 100 strands a day but anything above that need attention. My mantra to control hair fall is: 1)Sleep well and relax.2)Exercise as it improves blood circulation in the body and scalp. 3)Have food rich in vitamins, minerals and proteins like fruits, green veggies, chicken, fish and eggs.4)Last but not the least, use a good hair solution like Parachute Advansed Therapie Hair Vitaliser.